I don’t usually foray into City Centre active mode transport options but what Auckland Transport have proposed that could have implications on Skypath will catch my attention. We know Skypath will be a boon for walkers and cyclists between the City Centre and the North Shore. The problem is the last leg between Westhaven and the City Centre is not that friendly to either active modes yet. Nor are the plans to connect Westhaven to the City Centre that much friendly either. The Westhaven to City cycle route is an important connection in Auckland’s cycle network, running between the Westhaven Promenade and Quay Street. View the route map and design details. Find out the timeframe for the project. Feedback status: open until Sunday 18 December 2016. Find out about having your say. The Westhaven to City cycle route is an important connection in Auckland’s cycle network. Running between the Westhaven Promenade and Quay Street, it links to existing or proposed cycleways across Victoria Park to Victoria Street and Franklin Road, Nelson St, and Quay Street. It also connects into the popular Wynyard Quarter area providing safe access for people on bikes to playgrounds, restaurants, cafés, markets and events around North Wharf and the Viaduct Basin. This work supports our vision to a deliver well-connected and integrated cycle path network across Auckland and forms part of the road and public space improvements we are carrying out within Wynyard Quarter. Find out more about AT’s cycling and walking programme. The route selected is a safe and direct route in to the city and is currently used by existing commuter and recreational cyclists, comfortable with riding on the road. Fanshawe Street was also considered as a direct route, however, it was discounted due to the significant bus and traffic volumes. The proposed route supplements the existing and proposed shared paths through Wynyard Quarter which provide safe access for people on bikes to playgrounds, restaurants, cafés, markets and events around North Wharf and the Viaduct Basin. Section one of the proposed route runs along Westhaven Drive, turning on to Beaumont St connecting with existing cycle facilities at the northern end of Beaumont Street and proposed facilities at the southern end of Beaumont Street. It then turns on to Gaunt Street and continues on to Viaduct Harbour Ave, and then turns on to Customs Street West where it meets up with the proposed route for section two. Section two of the proposed route runs from the northern end of the proposed Nelson Street cycle facilities at Market Place, turns on to Customs Street West (where it connects with section one) before turning on to the northern end of Lower Hobson Street. mark the route for cyclists. communicate to all road users that people on bikes are welcome here and improve safety by alerting drivers to the presence of cyclists. reduce vehicle speeds, especially at intersections where most conflict with cyclists occurs. make tram tracks on the route safer for cyclists by using an infill product. provide more crossing opportunities for pedestrians. The design incorporates a mix of coloured markings and surfacing, raised tables and humps, signage and zebra crossings. Download the section 1 overview plan (PDF 2.3MB). Download the detailed designs for section 1 (PDF 2.8MB). On-street parking will be retained where safety of cyclists and pedestrians is not adversely affected and at this stage we do not anticipate the loss of any parking. Provides a safe, direct link from Westhaven to the CBD for people on bikes. Improves safety by alerting drivers to the presence of cyclists. Provides more crossing opportunities for pedestrians. Reduces vehicle speeds, especially at intersections where most conflict with cyclists happens. Is an important cycling connection in Auckland’s Cycling Network, connecting to existing and planned cycling facilities: Nelson Street Cycleway, Westhaven Promenade and the proposed Skypath link to Northcote, Quay street cycleway, Wynyard Quarter shared paths. Open until Sunday 18 December 2016 – feedback on design options. Section 2 completes the connection from both Westhaven Promenade and the Nelson Street cycleway to the Quay Street cycleway. Early 2017 – consultation on design options. We want to hear your views on the design for section one of the Westhaven to city cycle route. Your preferences and experiences will help us deliver the best possible facility for the route. Give your feedback by Sunday 18 December 2016. If you have any difficulty completing the form, you can call us on (09) 355 3553 and our contact centre staff will fill in the feedback form with you over the phone. A report on the feedback and the selected design will be available here in early 2017. If you provide your contact details when you give us feedback you will be notified when the report is available. What Auckland Transport has proposed is rather underwhelming for an area that is meant to be pro people not pro cars. I am aware there is push back by senior people in Auckland Transport at more dedicated cycling infrastructure (think separated cycle ways and shared spaces) but we must push back. Panuku Development Auckland has a mandate for Wynyard Quarter to be a people’s space not a giant car park or rat run. AT need to do their part and I wonder if on street parking is really needed with off street parking facilities near by in places like Fanshawe Street. Also are those Sharrows I see in the maps? Our counterparts in the Northern Hemisphere have released papers saying sharrows are dangerous and more useless than just having a general street. Sharrows are the dregs of bike infrastructure — the scraps cities hand out when they can’t muster the will to implement exclusive space for bicycling. 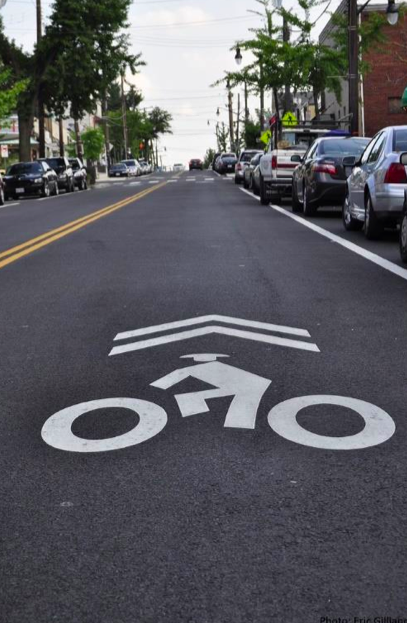 They may help with wayfinding, but do sharrows improve the safety of cycling at all? New research presented at the Transportation Review Board Annual Meeting suggests they don’t. Excuse the flooding in the one of the shots, I need to improve the storm water provisions in that one. In any case you can see you see how I use the cycle boulevards (accepts only active modes and service traffic like garbage, police, fire and ambulance) connect both within a local area and between two to several districts across the City. The cycle boulevards are used in both commercial and residential areas and are often very heavily used. Layton City has several cross-city cycle boulevards and many intra-local connections which the Wynyard Quarter proposal by AT would be. If you want an ironic twist the highest land values and amenities are often found along a cycle boulevard or pedestrian road (closest thing to a shared space) NOT a two lane road with on street parking. It is a case of we need to get behind AT with the Wynyard Quarter proposal and go from sharrows to separated cycle lanes and full cycle boulevards!